2008. A temporary, site-specific public art feature at Plummer Park in West Hollywood, CA. Photographed by Robert Wedemeyer. Image courtesy of John O'Brien. 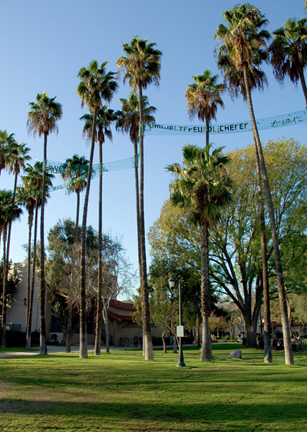 (in the) Greening is part of Go to the Park, the first project under the City of West Hollywood's Eastside Arts Initiative public art program. It has a public art component on site in the park and is accompanied by a specially designed poster in a bus kiosk on Santa Monica Blvd.